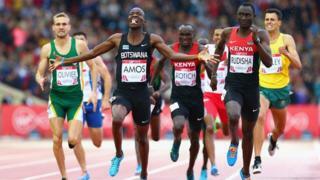 Botswana's Nijel Amos out-sprints Olympic champion and world record holder David Rudisha to win a dramatic gold in the men's 800m final at Glasgow 2014. Amos, who looked in danger of being boxed in, produced a perfectly-timed sprint from 70m out to win a thrilling contest in 1:45.18. Kenya's Rudisha finished in 1:45.48, with South African Andre Olivier - Amos's training partner - taking bronze in 1:46.03.